Still got a nice big case of CBF today, I'm blaming the 12 hour. A quick count of how many weeks it is until the Otway (12) has helped a little with motivation, but I'll spend the next few weeks getting it really ingrained in my head. 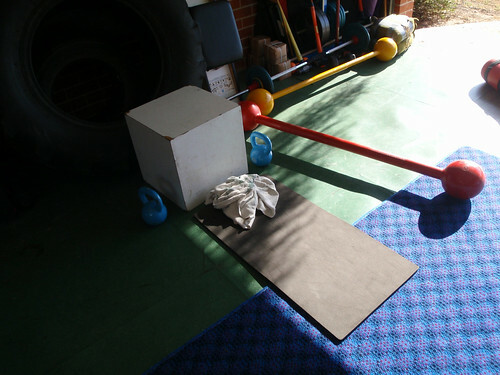 We super-setted the Box Jumps and the Step ups to lunges. For the second week in a row I mashed my foot into the box, thankfully it was the other one from last time. Trying to keep up with Jeff on the jumps was tough, i had to land into a squat and just pound out the next rep from there, this served to make my legs wobby and jack my HR just in time for step ups, where thankfully I was able to make some ground up. Justin asked me if I was doing the burbs tonight, I took this as a challenge to my manhood and headed out with a decent sized early bunch (6:45). Not surprisingly I didn't have any snap in the legs, but I managed to play with the Total Rush boys on all the climbs. That helped boost my confidence, I wont say it was easy, but being up there despite having a bag and post a weights session shows that I do actually have some speed on a bike.